Our objective being, to design a fresh and unique line of custom built trombones with the most demanding musicians in mind. The Elliot Mason Signature Series uses the finest materials available and unparalleled customization options that allow you to personalize how your horn feels, reacts, and sounds. The option of several brilliant and innovative features enable you to tailor an instrument to your preferences, embodying your personality. Mikes impeccable standards and tight tolerances during assembly separate this horn from the competition. 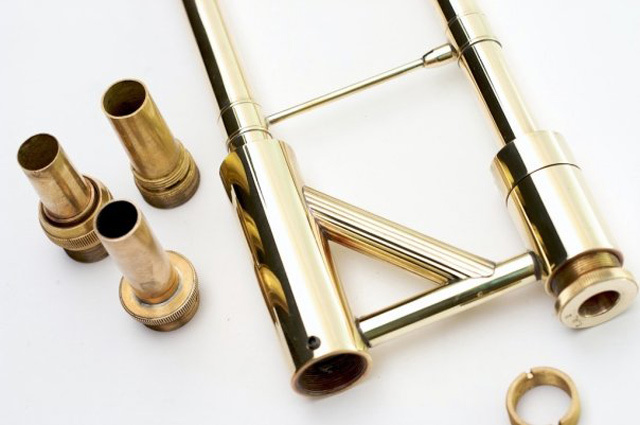 Thanks to our unique interchangeable slide-to-bell receiver system, the handslide stands on its own as an enhancing piece of equipment that can literally be paired with any trombone bell on the market. Mike has threaded adapters readily available to fit most major brands, and custom adapters can be easily manufactured upon request. The custom leadpipes were one of the things I was extremely excited to experiment with, not just the tapers but the wide range of materials on hand. Materials that are available include nickel silver, yellow, gold, red brass and 100 percent copper. We currently offer 3 different tapers designated A,B, and C (each with a different rate of taper). Each taper is available in multiple lengths to ensure that you have complete control over the resistance and response that you desire. My current all round favorite is the “B2-C model” (in copper), a long, focused pipe with a medium rate of taper. Each handslide features an ergonomic slanted left hand brace, as well as slightly oversized cork barrels for optimal comfort during performance. In addition, the right hand grip is significantly thinner than any other model available. For me, this facilitates a relaxed slide technique with more efficient use of the wrist, particularly during lengthy slide movements. Additionally, the smaller grip lightens the outer slide significantly, contributing to a lighter feel and faster slide action. Traditional hand braces are also available upon request, as are other custom options to suit your individual needs. Yet another unique feature of the Elliot Mason Signature Series handslide is the elliptical end crook. Unlike a rounded crook (i.e. King) or a squared off crook (i.e. Bach), I selected a more drastic elliptical bend for my instrument. This causes the handslide to gain an unbelievable focus and clarity as the airstream is quickly and efficiently redirected from one set of slide tubes to another. Articulations speak clearly with less effort, and the whole instrument seems to respond with a fantastic ease of playing. These end crooks are available in 100 percent copper, gold brass, yellow brass and nickel silver. I am so proud to be associated with the Signature Series handslide, I feel it has redefined today’s standard and is without a doubt my favorite handslide on the market. The Elliot Mason Signature Series handslides are now available to order, we are in the final production stages of our bell sections, all with the larger aim of continuing the development, innovation, and evolution of the trombone. 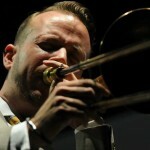 What kind of bass trumpet do you play? Hey Patrick, I play on a Bach Mount Vernon Bass Trumpet. The Mount Vernon’s are hard to come by but you won’t be disappointed with the newer bach’s either. hi master! and your mouthpiece? It’s a prototype right now, I’m working with a new company that will be bringing fresh and unique ideas to pieces very soon. Stay tuned..
Are you currently playing the BAC E. Mason Slide? What bell do you use with it? Hey Elliot, it’s been a while. I hope all is well. Any updates on the new mouthpieces? Hey Elliot. What trombone are you using? ive been looking at a couple new ones and am stuck. Been playing around with a yamaha custom z and a bach stradavarius. kind of leaning towards the yamaha. since the first note i have been in love with it. ever played one of them? Hey Payton, I’m playing my Signature Series made by B.A.C. The pictured slide above paired with the latest version bell section (pictures to come). These things are all personal, be open and try as many horns as possible, then if you’re still in love with the Yamaha, that’s the one. I had the same feeling when first playing what now is my model slide, and again paired with the new bell section. Love at first note. Will your actual trombone be available to buy? 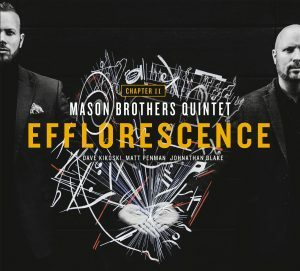 I have found the Elliot Mason “artist series” on the BAC website, but not the actualy trombone you use. I have a Jupiter XO bass trombone, and I was wondering if you made any slide for bass trombone, and also where I could find the slides you have available for purchase. Thank you! Heard you with JLCO at Wolf Trap the other night, and was confused by the Moon Over Cuba solo. It certainly looked like bass trumpet, but sounded conical bore to my ears. Was it the Bach bass trumpet you mention earlier, or some sort of Flugabone thing?